Apple is having issues today with many of its cloud services including the App Store, iTunes Store, Mac App Store and iCloud. If you’re an Apple user, you’ve probably realized this already. I was streaming my music library in my car from my iPhone (iTunes Match is wonderful) on the way to work this morning, when I noticed songs just kept skipping without playing. I assumed my phone was just acting up, and this was another hiccup added to my growing list of small annoyances on my iPhone. Once I got to the office, I did an erase, but when I got to the step where I restore from an iCloud backup IT WOULDN’T RESTORE! I tried to restart the restore but no luck. At that point I did what I should have done to begin with, a quick online search and I learned it wasn’t just me having trouble. What this means to you: You may have issues with purchasing, re-downloading and accessing content from Apple on your Apple phones, tablets and computers. Also, your iCloud backups at this time won’t backup or restore. Impact to work: None – just wait through it. 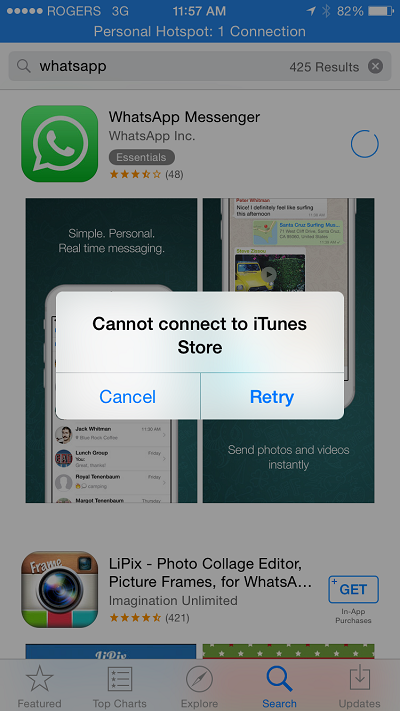 You won’t be able to download apps until this is sorted out. Third party applications (like Adobe Creative Cloud or Microsoft Office) on your Apple computers will not be affected. What you should do: Nothing – wait it out. Update: 3:45pm EST – App Store, Mac App Store, iTunes store, iBook Store still down – and latest attempt at restore of my iPhone from iCloud backup hangs. Update: 5:00pm EST – all services back up according to the Apple system status page AND my iPhone is finally restoring from iCloud backup! Mat Panchalingam is Sr. Director of IT Operations for ITWC. You can follow him on Twitter at @mpancha.